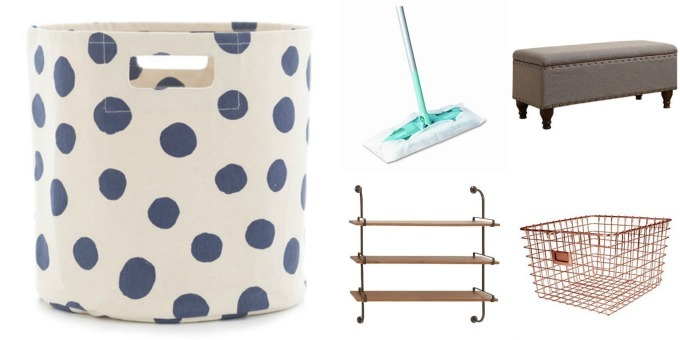 It's officially Spring and all I want to do is clean my house. Well, not really, but I wish it would magically be clean 24/7. A lot of people ask me how I keep my house so clean with small children, and today I've partnered with Wayfair to share a few of my cleaning and organizing secrets! Cleaning and organizing an entire home is extremely overwhelming. So start small. Write out the rooms that you want to focus on, rather than running around like a chicken with its head cut off (how I look most days). I like to start with the closets. I don't know about you but I am easily distracted. I've learned that I have to dedicate long pieces of time to cleaning/organizing or it won't get done. Weekends are insane around my home, and trying to clean with 3 kiddos running around is VERY frustrating, so I like to take 1 day off of work in the Spring and get as much done as possible. Products L to R: Linen Bin. Swiffer. Bench. Wire Basket. Wall Shelf. My first step to having a home that's clean more often than not is to get rid of the junk and items It don't use or need anymore. The more toys I have in baskets and closets the more toys will be scattered around my home. You may think "Geez...so she doesn't let her kid have any toys?" That's not what I'm saying. My kids have toys, but not a ton. My son has a few small baskets of toys in his room, but that's about it.We have our sports items outside in the garage, and we try our hardest to spend lots of time outside. Once I've gotten rid of the stuff I don't need, I want everything to have a place. Storage is KEY. In the Spring, I put my winter clothes in tubs and slide them under my guest beds. I also love using vacuum bags because they don't take up much space. For kid's items I like to store items in see through wire baskets so they can find their toys easily. For items that aren't cute or don't need to be seen, I put them away in closets or in cute baskets like these. I have a feeling I'm going to need a large toy box for Whitney and Walt's dress up clothes. Products L to R: Wire Cubical Storage. Underbed Box. Toy Box. Vacuum Bags. Banana Leaf Baskets. When it comes to a clean home, focus on the areas that bring you the most happiness. For me a clean kitchen is my version of pure bliss! I'm in desperate need of a new Swiffer sweeper, because I'm currently hand cleaning my floor with a clorox wipe...y'all this is not ideal. My living room and kitchen are the most used areas, so I clean them the most. I have a few baskets in my living room for toy storage, but they are cute enough they fit in with my decor. 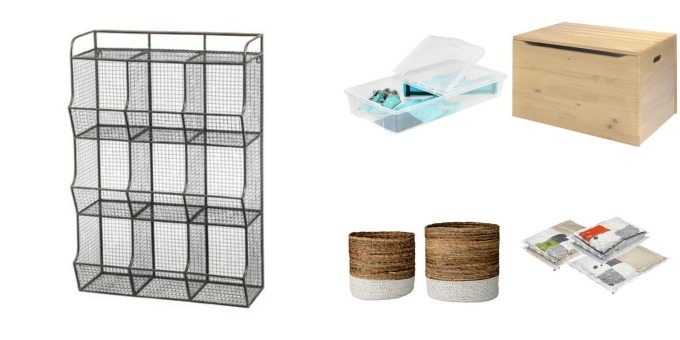 These baskets are perfect for living room storage. Dusting is also key because I always forget to, and allergies are super bad this time of year in Texas. Have you switched your wardrobe from Winter to Spring yet? It almost his 90 degrees in Texas last weekend, so I finally made the switch. I love pulling out my spring/summer outfits and feeling like I just went shopping. I hope these tips help you in some way. Now get to cleaning folks! LOVE that wire cubby thing! !